Fashion Week will descend on Lincoln Center for the first time tomorrow, but the buzz is already in the air. Film crews, trailers as press points and an added presence of police were out on the scene this morning. On Saturday, construction crews were still building the spiral walkway and today they were inflating a giant rectangular faux marble balloon, providing an aura of permanency to the very-temporary event. The balloon is supported by steel beams inside,which were still visible on Saturday in the picture below. 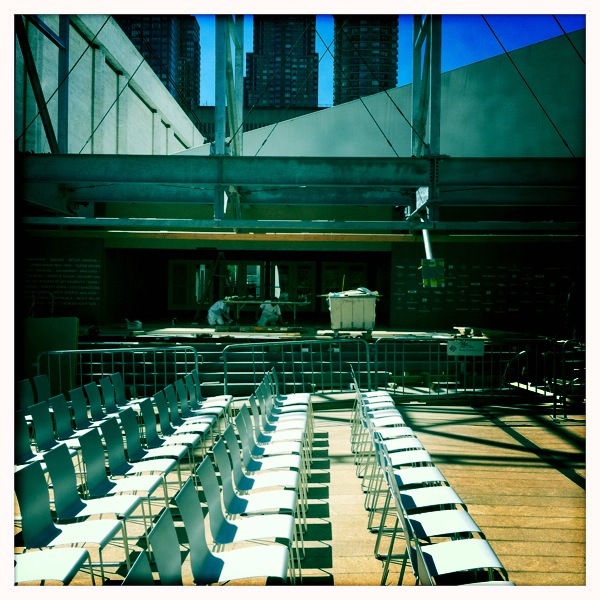 Entrance to the Spring ’11 Fashion Week shows, under construction Saturday. The seats were for the Metropolitan Opera Summer HD Festival. It’s interesting to me that they chose to put the entrance to the tents offside, not in the center of the Lincoln Center Plaza. In Bryant Park, the tent entrance was just at the top of the central staircase on 6th Avenue, and the whole affair was quite visible to the passerby. As a resident here, I am certainly grateful my morning walk to the subway will not be deluged by fashion week attendees. However, I used to be one of those attendees. Most people want to know how to get tickets to these events. Well, the answer is that the fashion shows are not intended for the mass audiences not so much to be exclusive but that they are intended for press (and celebrities) of course, before the clothing actually gets produced and shipped to stores six months later. The New York Times today reported on the battle for front row seats this year, but I once had access to the first and second row seats (now known as “Siberia”). Attending shows also comes with some perks and brushing shoulders with celebs: I got many pairs of free Havaianas (before they were cool) at the Rosa Cha show where all the top models walked including Naomi Campbell and Carmen Kass, attended by Jay-Z, Beyonce, Cuba Gooding Jr., Russell Simmons and more, and talked to Andre Leon Talley (Vogue) about various shows. After working for IMG/Fashion Week and then as a buyer for Calvin Klein, I exited the fashion industry. I still help out designer friends for their fashion week shows, so I will be reporting this year on what it is like for designers that do shows outside the tents, which is a much more cost-effective strategy for up and coming designers. IMG/Fashion Week is hoping that the larger Lincoln Center space will provide the opportunity to host exactly those newer designers in the future. Let’s hope they make it financially viable too.